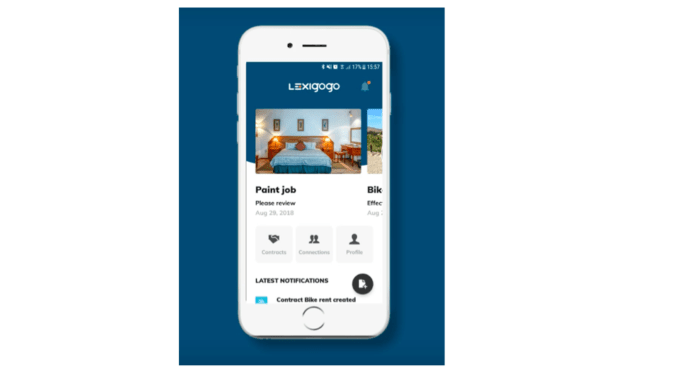 A new legal tech startup, Lexigogo, has launched a mobile phone app that allows people to make legally binding contracts using just their voice and their phone’s video camera, without the need for a written agreement. The app, which is available in both the Apple App Store and Google Play takes a surprisingly down to earth approach to legal tech and focuses on the fact that two people can – if they want to – contract quite legally in this way. An example, which is provided by the founder, Laurens Theunis, is that of a homeowner contracting with a decorator to paint a room. You video the room, explaining verbally what the other party will do. Then you send it to the other party via the Lexigogo platform, electronic signatures are made, and the contract is then stored in the cloud so both parties can access it. Would you want to use this for a major M&A deal? No, of course not. It’s clearly a consumer-focused application. But, it could be useful especially in scenarios where a client is uncertain that a service provider will deliver on their promises – anyone who has used builders in London will understand. Perhaps with video evidence of what the provider has agreed to there may be a greater likelihood of them actually doing what they said they would? Either way, it’s probably easier than drawing up a written contract for what will be a relatively small project, but which may mean a lot to the buyer of the service. The offer and acceptance. An offer is made by one party which is then accepted by another. Legal purpose. The purpose of the contract must be lawful. Lawful consideration. There must be an exchange of value (monetary or otherwise) between the parties and what is exchanged must be legal. Certainty of terms. The terms of the contract cannot be vague, incomplete or mistaken/misrepresented. Free consent. The parties, both being of sound mind, consent to the terms of the agreement freely, meaning without undue influence, coercion, duress or misrepresentation of facts. Given that many people have mobile phones, even in the poorest developing nations, this may in fact turn out to be very useful for people who don’t want to – or cannot use – complex written contracts for whatever reason. It could be a bit like the cartoon contracts we all see at conferences about legal design, i.e. legally binding contracts designed to be understood by people who cannot understand the local language. That said, it’s possible that one of the contracting parties is unreasonable, or perhaps demands things that are not legally enforceable. Also, if one of the parties fails to comply with the contract you still end up in a scenario where someone has to go to court. In short, it’s not a silver bullet, or a perfect solution, but AL has to admire the clarity of vision of the designers here and it could have great use cases in markets where literacy is not high or where trust is an issue. What do you think? Is this taking the idea of verbal contracts a step too far, or is this in fact quite brilliant and leverages technology that we can all make use of to increase legal security for potentially millions of people? Here are some videos by Lexigogo. The first one you may need to turn up the volume for. Enjoy. There are specific contracts which the law requires to be in writing for their validity, enforceability or added efficacy. So query whether a video would qualify as a writing for the purposes of the statute of frauds. The point of the SOF is for their to be a recording that can be referenced by the parties or an a third-party neutral in the future. A digital video accomplishes that purpose the same as a writing written on parchment with a quill, or written on paper with a pen, or typed on paper with a typewriter, or written digitally and saved as an electronic file with a computer.